Looking for a little help on your next home project? If you live in the San Francisco area you might be in luck as GenieTown, a Palo Alto-based startup founded by a group of Stanford entrepreneurs, officially opened to the world today. GenieTown offers a platform for anyone looking for local services to either browse through a broad range of specific service providers or post a job request and invite qualified responses. 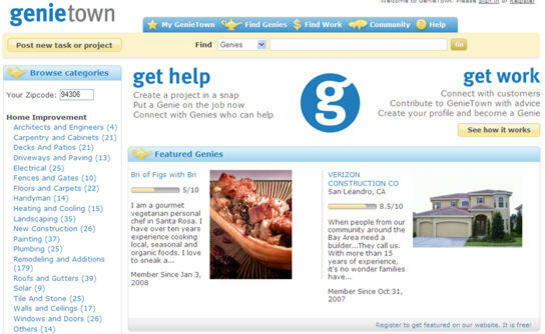 GenieTown creates an eBay-like marketplace for services. Like eBay, a GenieTown service provider can build up a reputation from positive transactions on the site. GenieTown also urges service providers to help users by contributing tips and tricks which also can result in positive reputation marks for the service providers on the site. If a user likes a particular service provider they can negotiate a price for services and actually complete the transaction on the site. Some sample services on GenieTown range from anything from home improvement to music lessons and help with setup a computer or wifi network. GenieTown is currently open to San Francsico-based listings but will be expanding to other areas soon. So rather than waiting for hell to freeze over, check out GenieTown and maybe get some help with that leaky faucet in the bathroom or that room addition project.